Create Viral Video Contests where visitors can share their video entry for your fans to vote on! Multiple options are available including options to limit votes to one time, once daily or setting a specific number of times a user can vote per contest. Select this option to begin creating a video entry contest. YouTube and Vimeo videos are supported. The Instagram Video Contest App is designed to help social marketers empower their mobile toting fans to participate in Instagram Video Contests hosted on their Facebook Page. With the marriage (acquisition) of Instagram by Facebook, the Instagram mobile app has gained new clout and status as a social sharing tool. The fact that it integrates easy cross posting of Instagram videos to Facebook, Twitter, and Tumblr certainly only helps as well! Now Facebook marketers can capitalize on this fast growing social media tool by hosting Instagram Video Contests on their Facebook Pages! 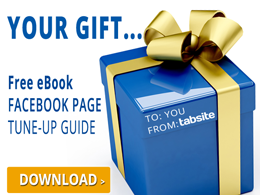 The Platinum Plan App allows Page Admins to setup a custom tab on their Facebook Page to host the Instagram contest. Visitors will enter the video contest by submitting a video to Instagram with the designated hashtag in the video description. The Facebook Page Admin sets this hashtag during setup. The TabSite Instagram App will pull in all videos for the hashtag from Instagram within the date range specified in the contest settings and visitors can then vote for their favorite entry. Perfect for the mobile savvy social community, this app enables Facebook Pages to capitalize on the use of Instagram and the power of Facebook for this contest. In the Manager section and then click the Add App button. Then, scroll down the page until you reach the Contest Apps. Search for the Instagram Video Contest App and click the Add+ button. In this page, you can upload all the images you would like to display in your photoshow. Be reminded that the recommended image size is 810 x 75 pixels in any of the following format: jpg, png or gif. Using Hashtags and Pre-approval setup helps you be in control of the contest entries. You can also set email alerts to alert you whenever a video matches your contest category. You may choose what kind of media is acceptable for your contest. And an option to allow tagging in commentds section. Setup Time Zone for your contest as much as the Start and End Date and Time of your contest. You may also detail the allowable number of times that a user can vote per contest. Display Options for your gallery can be set dependng on how you want your entries to appear and function. There is also an image size of 810 by 180 pixels. Please take note. The Language settings encompass three sections specifically Instagram Contest, General, and the Comment System. 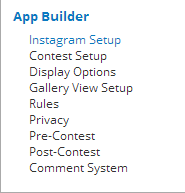 The Instagram Contest sub-setting of the Language section has the Language Settings to customize the default input information written on the fields of the variables. The Analytics page is the last one in the settings list. It has graphs representing the different traffic sources such as Overview, Facebook Views, Web Views, Mobile Views, Microsite Views, Shares, Likes, Entries, Votes, Export Entries, Export Votes. 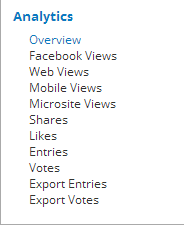 This is how you'll view the amount of Shares, Likes, Entries, Votes, Export Entries and Export Votes of your app. The moment you have finished editing all the settings for your Instagram Video Contest App, just click the green "Save" button.